Everyone is ugly sometimes. In a world not unlike our own, there is a phenomenon called the INEXPLICABLE DEVELOPMENT―a rare occurrence with permanent consequences. Average-looking, under-the-radar sixteen-year-old Konrad Wolnik's life is turned upside down when, one morning, he wakes up stunningly attractive. That same day, his classmate, Camilla Hadi, has her own transformation; the lean, pretty athlete is now devastatingly ugly. The teens face the cruel world of high school from very different perspectives. Konrad shoots to the top of the pecking order, Camilla slips into pariah status. But soon the school starts rallying around Camilla, and Konrad’s sudden popularity sours as people blame him for her transformation. And, the truth is, so does she. All he wants is for everyone to like him. All she wants is to destroy his perfect life. So what if they could use each other for personal gain? Told in dual POV, Sebastian J. Plata's debut is a hilarious, scathing look at society's unrealistic beauty standards and the intense pressures of high school. Perfect for fans of The DUFF and Winger. 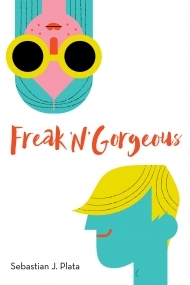 'Freak N Gorgeous' by Sebastian J. Plata provides an in-depth and telling look into the world of two teenagers who unexpectedly have their looks changed. The setting of the book is not unlike a normal world, but one large difference is that there is something called Inexplicable Developments in which people have changes happen to them based on wishes. These changes sometimes come unexpected and in ways that do not feel deserved, which is one of the main ideas of the novel. Konrad and Camilla are the two characters whose dual viewpoints are showcased from chapter to chapter. While Konrad has gone from average looks to being taller and considerably better looking, Camilla has had the opposite happen. She has gone from average looking to quite bad-looking, in the eyes of not only herself, but the vast majority of the school. Even though her friends stand by her when they first learn of her inexplicable development, she doesn't have many others who do, aside from her mother. Konrad, on the other hand, loses his friends due to the dramatic and sudden change that has made him what the most popular and good-looking kids consider gorgeous. Yet, despite his seeming good fortune, he comes to learn that beauty is not just something that one can see on the outside; the way one acts and treats others also plays a part. The main conflict of the story lies in the fact that Camilla learns of Konrad's change and attributes her own social downfall and poor looks to his wish to be better-looking. Even though nothing proves this to be true apart from Camilla's insistence that it must be, she holds firm thinking that he is to blame. When he tries to befriend her, she aims to use his friendship tactics against him, believing against all else that he's only doing it because it's good for him in some way. A novel that teaches the importance of looking beyond the surface and learning to deal with the hand that life deals you, 'Freak N Gorgeous' shows how getting everything you want isn't necessarily what it's cracked up to be, and getting dealt a bad hand won't necessarily bring the worst results. The play on words in the title is fun, too, as Camilla believes she's a freak while Konrad is gorgeous, but it also plays on another level, because they both realize that if they find a way to work together, maybe they will come to be "freakin' gorgeous," and come to be the best versions of themselves possible.